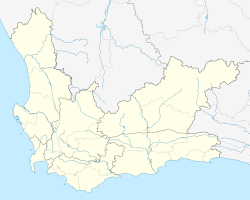 Bonnievale is a settlement in Cape Winelands District Municipality in the Western Cape province of South Africa. Town 64km south-east of Worcester, in the Breede River Valley. Founded in 1922 and named after the railway siding which had been called Vale since its opening in 1902 and Bonnie Vale in 1917. Municipal status was gained in April 1953. ^ a b c d "Main Place Bonnievale". Census 2011. 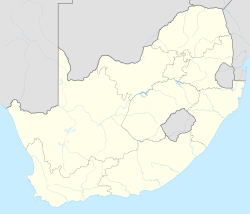 ^ "Dictionary of Southern African Place Names (Public Domain)". Human Science Research Council. p. 89. This page was last edited on 22 March 2019, at 21:16 (UTC).